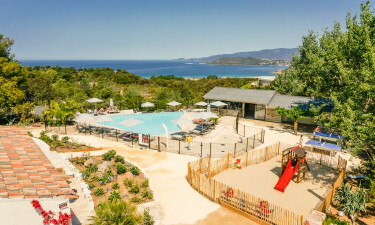 This beautiful campsite offers an haven of peace and nature on a mountain between Cargèse and Ajaccio. From this spot you can make beautiful day trips along the Corsican west coast with lakes, beaches, Calanches and the beautiful nature reserve. The campsite has various facilities including a beautiful heated swimming pool with sea view. Book your mobile home now for an unforgettable holiday. Why luxury camping at LuxCamp campsite La Casa? There is no need to leave the campsite to enjoy hours of water fun. 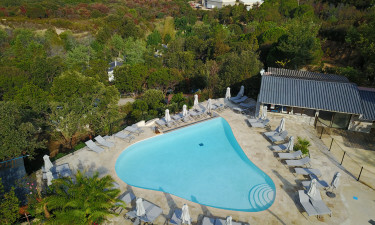 There is a beautiful heated swimming pool on the campsite that is perfect for a relaxing holiday. 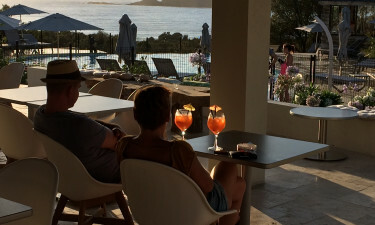 At the edge of the pool are comfortable sunbeds, from where you have a beautiful view over the sea. Moreover, the bar is located next to the pool, where you can order a refreshing drink. For swimming in the sea you only have to walk 10 minutes via a private path to the beach. In addition, the campsite has many sports facilities, including petanque, beach volley, football and ping-pong. For the little ones there is a beautiful playground. In addition, a friendly entertainment team organises everything from sports tournaments to theme nights. For a good appetite you can eat a tasty meal at the restaurant. There is also a bar where you can have a drinkor two. At the small supermarket you can get your daily groceries. In short, this beautiful holiday campsite offers something for everyone.